Race and maneuver to be in the proper position when scoring your checkpoints! Being first at the end of the race helps, but placing first at your scoring locations is even more important. Every turn someone could trigger a scoring point. Where will you be as you and your opponents control which checkpoints will score and which get bypassed? It is impossible maintain the lead throughout the race. Each racer plays from identical draw decks, playing multiple cards of the same color to provide a boost of speed. Beware, you may only reshuffle your deck at gas stations along the way, and when your hand or draw pile are depleted, you are in for trouble. Race smart and bring home the gold! 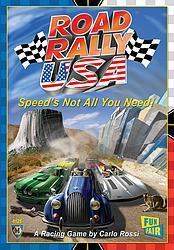 If so, Road Rally USA™ has you covered! Simply pressing the accelerator is not enough- you must be efficient- managing your fuel and coming in first at your optimal checkpoints to maximize your score! So get behind the wheel of your powerful machine and roar down the tracks as you compete to run the best race and you will surely win!